A dubious first-half penalty gave Egypt’s Smouha a 1-0 home victory over South Africa’s Bidvest Wits and lifted them to the African Confederation Cup group stage on Saturday. Chances were few and far between in the second leg of the Confederation Cup playoff but a penalty converted by striker Ahmed Hassan Mekki was enough to help Smouha go through after a 0-0 first-leg draw away from home. 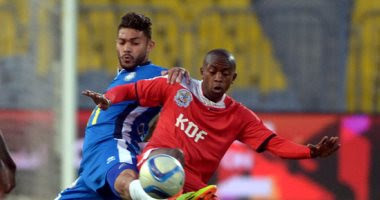 The decision to award the hosts a spot kick was controversial, however, after a Bidvest defensive clearance accidently struck the arms of a defender. Mekky sent Moeneeb Josephs the wrong way on 37 minutes and Smouha could have added a second three minutes before the break when a long-range powerful shot from Mahmoud Abdel-Aziz was tipped over the crossbar by the keeper. Smouha eased off after the break but Bidvest hardly threatened, with their only chance coming on 58 minutes when Siboniso Gaxa tried his luck from distance but keeper Mohamed Abou-Gabal was on alert to palm his effort away. The Alexandria-based club are making their first appearance in Africa’s secondary club competition but were present in the more prestigious African Champions League in 2015, finishing at the bottom of their group with four points from six matches.